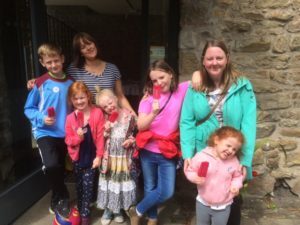 What an exciting morning this was, family fun as the children rushed round to complete their treasure hunt around Barrowford. They looked high and low for millstones, pigeon holes, at the fish pass and the bowling green, collecting red roses on the way. Everyone was successful and as every photo tells a story here they are enjoying their winnings!